Ars Antonina is an association was founded in 1988, and its mission is to organise concerts in support young to bring to the stage talented musicians, encouraging the relations of musicians within Europe and with other countries. Liya Petrova was Born in 1990 in Sofia, Bulgaria, in a family of musicians. She was only 8 years old when she won the Mozart Medal and was elected Best Young Artist of UNESCO. She is also the winner of international competitions including Tibor Varga in Sion and Louis Spohr in Weimar. 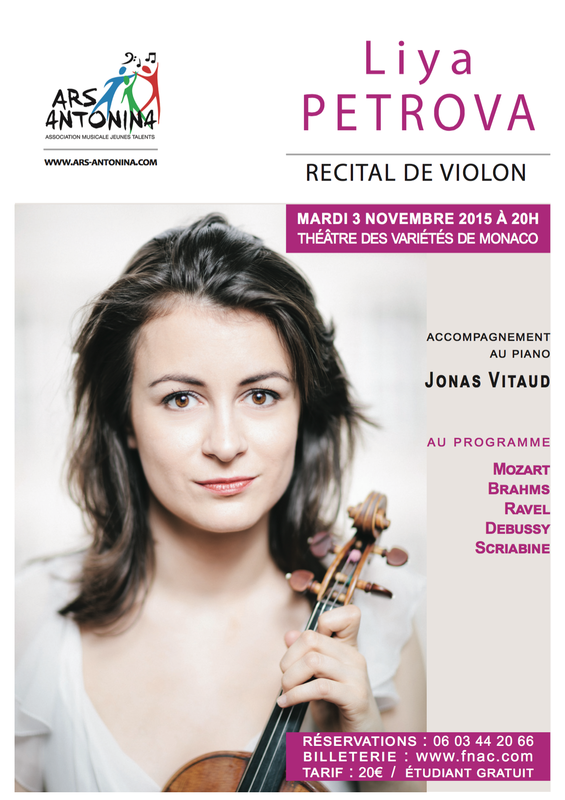 Petrova performs as soloist with many of the leading European orchestras, more recently the Brussels Philharmonic, and also the Luxembourg Philharmonic, Laussane Chamber Orchestra, Osaka Philharmonic, Monte-Carlo Philharmonic Orchestra, Orchestra of Cannes and PACA, Varsovia Orchestra, National Orchestra of Montpellier, Weimar Staatskapelle and Norredeutsche Philharmonic. This young artist has appeared in many of the prestigious festivals in Europe, including Mecklenburg Vorpommen, Rheingau Music Festival, Gezeïtenkonzert, Festival of Martha Argerich in Lugano, Athens Festival, Festival of Luna-Classics à Nyon, Festival de Radio France in Montpellier, Menton Festival, and Festival de Pâques in Aix-en-Provence. She also participated in the Martha Argerich and Friends series of chamber music concerts in Athens, performing with Martha renowned artists like Argerich, Renaud Capucon, Yuri Bashmet and Mischa Maisky. Liya plays a Matteo Goffriller 1690 violin, a generous loan from the Queen Elisabeth Music Chapel. Her first disc – Violin Concerto No.1 of Saint-Saint with the Royal Philharmonic Orchestra – was acclaimed by the critics and the public. Jonas Vitaud was born in Paris in 1980, and started to play piano at the age of 6 and the organ at 11 years old. He studied with Brigitte Engerer, Pierre-Laurent Aimard and Christian Ivaldi and was given four first prizes at the Paris National Conservatory (piano, chamber music, harmony and piano accompaniment). He has been awarded several international prizes as a soloist and in chamber music (Lyon, ARD in Munich, Trieste, Beethoven in Vienna). Vitaud continues to give performances in recital and also with orchestras. He appears regularly at numerous famous festivals in Europe and throughout the world. He is invited to perform as a soloist with orchestras in Europe, including the Toulouse’s Capitole Orchestra, the Philarmonic of Moravia, the Bavarian Radio Symphony Orchestra, among others. He has also dedicated himself to chamber music, a passion that he has shared with such artists as Janina Baechle, Bertrand Chamayou, Henri Demarquette, Thierry Escaich, Gérard Caussé, Janja Vuletic, Geneviève Laurenceau, and others. Passionate about contemporary music, he has premiered works of such gifted composers as Thierry Escaich, Christian Lauba and Edmund Campion to name a few. He has worked with, artist of high level, like Henri Dutilleux and György Kurtag, who have inspired him greatly and helped him develop as an artist. 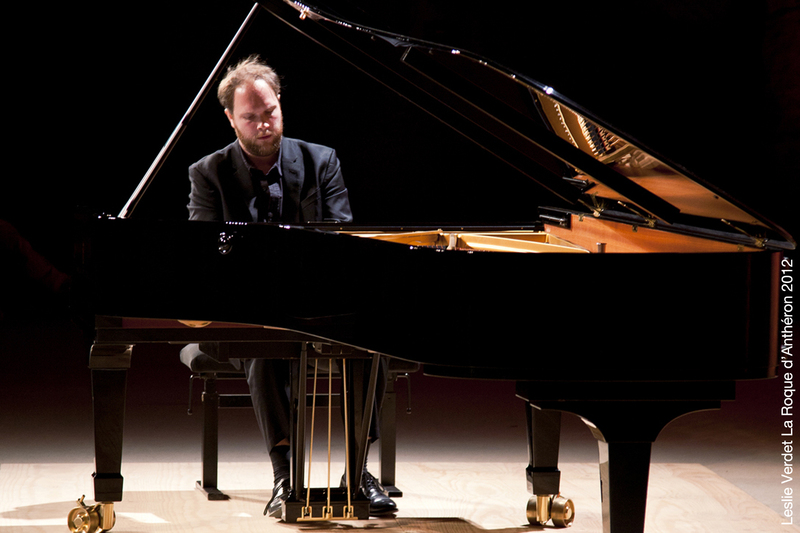 Jonas Vitaud released his first solo album dedicated to Johannes Brahms. Since 2013, he teaches at the Paris National Conservatory (sight-reading and accompaniment).